It can be so easy to find yourself drooling over the prospect bringing in new customers. Unfortunately, this can mean that current and previous customers are overlooked. Current customers are a goldmine of information that can be used to draw in new customers. In 2013, Nielson found that 68% of people trust online opinions from other consumers. Did you notice that the study didn’t say that consumers trust “marketers”, instead it mentioned “other consumers”. We often talk about executing all digital marketing tactics with customers in mind. Sometimes we fall into the trap of focusing strictly on creating customer personas (they do have their place) and deciding as a marketing team what our customers need and want. An overlooked and seemingly simple approach is to reach out to customers, collect information and listen to feedback. Sounds simple right? What Are Some Ways to Begin Gathering Information? B2B and B2C businesses alike have many opportunities to stay in contact with customers. More often than not, your customers have provided some means for you to contact them, typically via email. Surveys: Stick to the most necessary information needed to encourage customers to complete the survey in its entirety. Depending on the audience, a good way to encourage response is to offer some sort of reward for completing the survey. Customer Feedback Forms: Often, customers may be searching on your website for answers to their questions. If you provide the option for them to complete a quick feedback form during this experience, it will be top of mind. Forums: If you’re able, consider setting up a customer hub of sorts where they can ask questions and share feedback. If the forum lives on your website then you are better able to juggle responses than if the response is on any one of the social media networks that you manage. Set Up Regular Temperature Checks: Sometimes you communicate with your customers on a regular basis. It’s recommended that you run a quick temperature check with these customers on a quarterly basis to determine what additional needs they may have that you are not meeting. 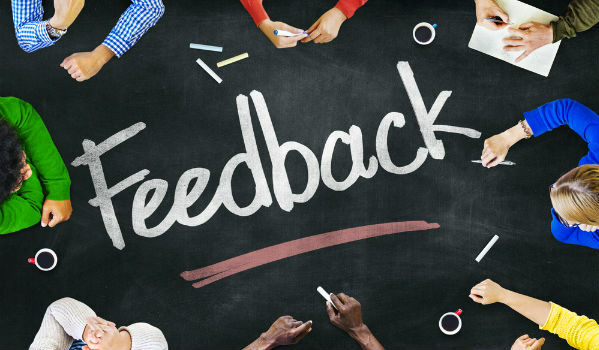 Anonymous Feedback: If the customer relationship is close, it may be hard for the customer to share feedback directly to the team. One option is to allow them to share anonymous feedback which avoids putting them on the spot. Live Chat: Sometimes customers just don’t want to write a long email or chat on the phone. Live chat provides a quick option for getting answer to a question or sharing relevant feedback. Never brush negative feedback under the rug in hopes that it will go away. That’s when it really begins to rear its ugly head. After the show aired, things took a turn for the (even more) bizarre. 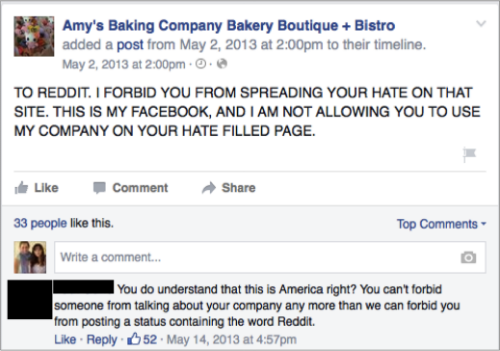 The restaurant owners Amy and Samy began taking to their Facebook page to rant about the people that alleged were “spreading hate” about their company. 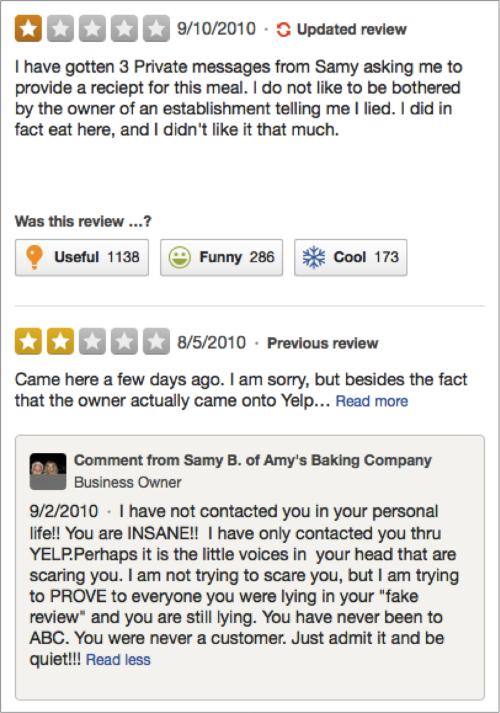 Amy’s Baking Company is just one example of many companies that have lost many more customers than they gained by reacting very badly to poor reviews. It’s true, sometimes your company may receive a review that is unsavory or upsetting. That is outside of your control. What you can control is how you react. If possible, try to solve these issues “privately” via a direct message or contact with the customer that is having an issue. Try to take an authentic approach to each problem and make an attempt to rectify the situation. Unfortunately, unhappy customers often make much more noise than happy ones. That’s why it’s our job as marketers to draw that information out of them. What Should You Do With Customer Feedback? All feedback, good and bad can help your business. Why? Because knowing who your customers are and what is important to them is what will help your business grow. 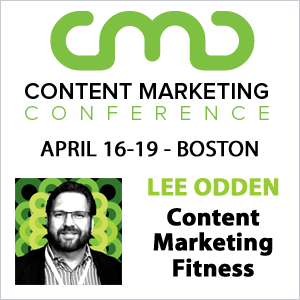 Content Marketing Plan: Hearing the issues and successes that your customers have had in working with you can be incredibly helpful when building your content marketing strategy. This will help determine what topics and asset types will be more impactful for attracting new customers. Social Media Presence: An often overlooked component of social media marketing is the tone and voice used to communicate with your fans and followers. Interacting with your current customers and asking strategic questions about how they like to interact with brands like yours on social media can provide valuable insight into the approach you should take on social platforms. Paid Search Strategies: Again, if you’re asking the right questions, the responses can affect many or all of your digital marketing strategies. If for example, you ask new customers what it was that drove them to you, or what they were searching for the moment they were ready to buy, it can help inform your approach to paid search. Many companies have also taken steps towards instituting a client advisory board. The business can utilize insights from this board to improve marketing messaging, operations and any other department’s output. What is the most useful nugget of information that you’ve ever received from a customer, and what action did you take once you received the information? Great advice in here Ashley! I completely agree that your current customers are a great insight into how you can help to gain new customers. Keeping your current customers happy by listening to what they have to say and working with them to be better will not only help you to keep them as a customer, but likely also make you more attractive to new customers. As well, I’m always a firm believer that if you can keep current customers happy that they will be the ones who really help you to bring in new ones. And thank you so much for giving Sysomos a shout-out in this great piece as well!